April 22nd is Earth Day, yet for most people, it probably went by unnoticed, just another regular Sunday for most of us. Earth day is meant to be a day where people around the world work together to help raise awareness for environmental protection yet many people around the world still aren’t doing their part in reducing plastic pollution. However it shouldn’t just be the average person’s job to help in reducing plastic pollution, in most countries the government is a representative group that is meant to help and leads the people, so today I want to ask, what can governments do to help reduce plastic pollution. Lots of strategies for reducing plastic pollution are from the perspective of the average person (see: 10 Ways to Reduce Plastic Pollution by The NRDC (natural resources defense council)), however, I believe that governments should prioritize and value-reducing plastic pollution more and therefore I did this project from the perspective of the government and what they can do to promote reducing plastic pollution. 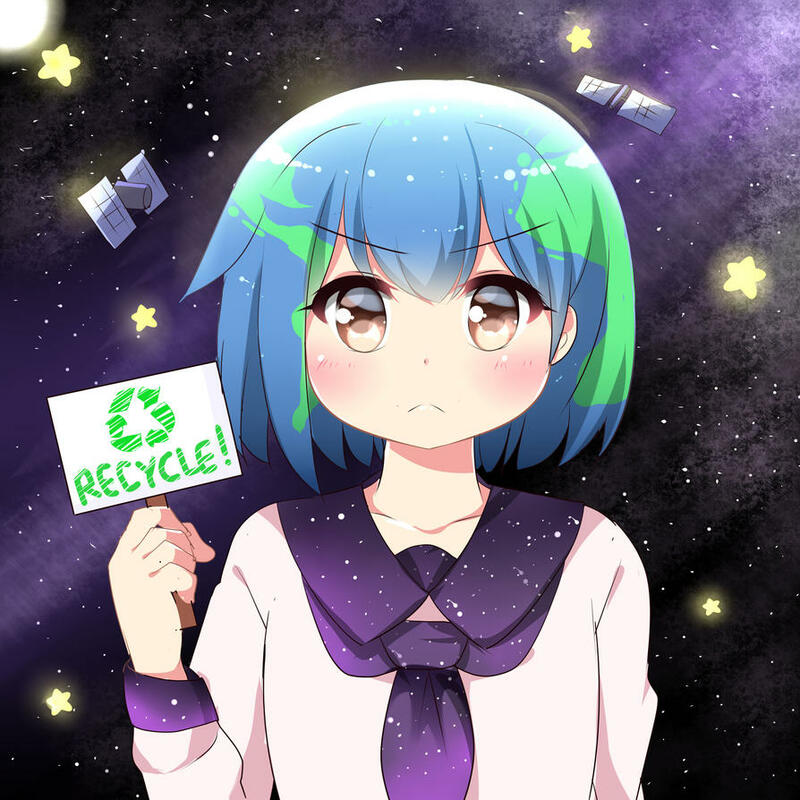 Question: I recycle things like plastic bottles often and don’t see much pollution and littering around, so is plastic pollution really an issue? Answer: Yes it is, just this month “a six-ton sperm whale washing up on the shores of southern Spain with 64 pounds of plastic in its stomach” (7 things we’ve learned about Earth since the last Earth Day by Vox). This is an appalling reality that not many of us want to accept but it shows, however, the shocking amount of plastic waste we are putting in the ocean. Another shocking article on the amount of plastic waste in the ocean (More Plastic in the Ocean Than Fish by 2025). For another example look at this article on the effect of plastic pollution on turtles (Plastic Ocean Killing Turtles) or this heartbreaking video of a sea turtle with a straw stuck up its nose (WARNING THE VIDEO IS A BIT GRAPHIC, WATCH AT YOUR OWN RISK). Strategies: The strategies of the average person are to either contribute to pollution (A) or to not contribute to pollution (B). The government’s strategies are to punish people who pollute (A), to incentivize people to help fight against pollution (B), or to raise awareness for pollution in order to get people to not want to pollute (C). For this project I’m only working on strategies that the government can use to help stop the average person from polluting, I don’t focus on strategies to stop companies or businesses from polluting. I’m also not talking about things like “What laws could help reduce pollution?” I’m more focused on the broad acts that the government could take to get the average person not to pollute things like implementing laws may be part of these larger strategies. I left it unspecified how the government goes about achieving these strategies, I did, however, assume that if the government decides on a strategy it will be implemented effectively. I also organized the government’s strategies as 3 large categories, they can punish people who pollute, they can incentivize people to not pollute or they can raise awareness and educate people about the effects of plastic waste and pollution. In outcome a (where the government punishes people who pollute yet the average person contributes to pollution anyways) I assigned it a value of (15,15) because the government will have spent resources on trying to enforce this while the people will just either have to take the punishment or find some way to get around the punishment. In outcome b (where the government incentivizes people to help clean up pollution, yet the average person still pollutes anyways) I assigned it a value of (25,100) because the government will have spent money when trying to incentivize people to clean up but only some people will take advantage of this and others will be unaffected. In outcome c (where the government tries to educate people on why they shouldn’t pollute yet the average person pollutes anyways) I assigned it a value of (10,10) because the government will have spent lots of time and resources to try to educate people on why they shouldn’t pollute yet the people do it anyways, and the people who pollute anyways will now know about the harm caused by their polluting and will feel guilty. 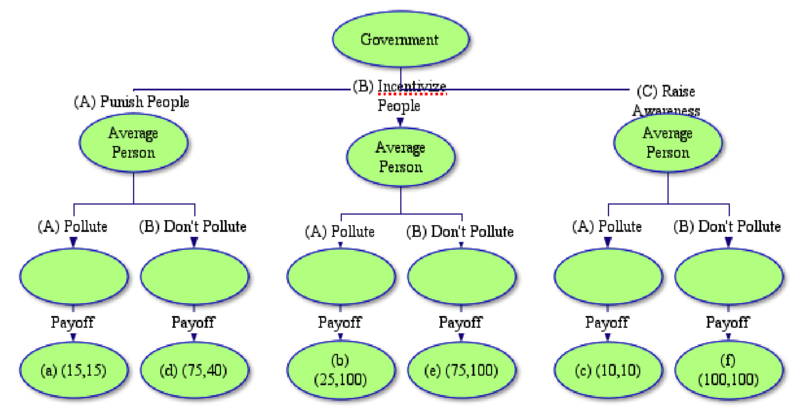 In outcome d (where the government punishes people who pollute, and the average person doesn’t contribute to pollution) I assigned it a value of (75,40) because the government will have succeeded in getting people to not pollute and the people will have to accept the punishments if they do pollute. In outcome e (where the government incentivizes people to help clean up pollution and the average person doesn’t pollute any more) I assigned it a value of (75,100) because the government will have spent money when trying to incentivize people to clean up and those that will take advantage of it will and those who won’t take advantage of it will remain unaffected. In outcome f (where the government tries to educate people on why they shouldn’t pollute and the average person doesn’t pollute anymore) I assigned it a value of (100,100) because the government has a long-term and sustainable way to stop the pollution where the people have stopped polluting because they want to. This value is more flexible than the others because it depends on how much people value stopping pollution, but because I personally believe that stopping plastic pollution should be a larger priority for most people I put it as a 100. The conclusion that I came to is that the best solution to this issue is to raise awareness, however, not many governments have raising environmental awareness very high up on their list of priorities. So what can you the average person do about this issue, one good way to help raise awareness is to celebrate Earthday every year and help spread the message to everyone you know. If you live in a democratic country then you can help to influence your government into taking action. Even if governments don’t intervene and help to reduce pollution the average person can still act on their own, you can still have an effect on this issue by choosing not to pollute or by helping to reduce your own plastic waste. A good example for the way that you can go about doing this is: 10 Ways to Reduce Plastic Pollution by The NRDC, this link gives you, the average person, many strategies on how to reduce your own plastic pollution. ikazu-Art401. “Earth Chan.” DeviantArt, Dec. 2017, ikazu-art401.deviantart.com/art/Earth-chan-720958489. Accessed 25 Apr. 2018.
bkbridgeadmin. “Happy Earth Day!” Brooklyn Bridge Realty, 19 Apr. 2017, brooklynbridgerealty.com/2017/04/19/earth-day/. Accessed 25 Apr. 2018. CostaRicanSeaTurtles. “Sea Turtle with Straw up Its Nostril – ‘NO’ TO PLASTIC STRAWS.”YouTube, YouTube, 10 Aug. 2015, www.youtube.com/watch?v=4wH878t78bw. Accessed 25 Apr. 2018. Engler, Sarah. “10 Ways to Reduce Plastic Pollution.” NRDC, 5 Jan. 2016, www.nrdc.org/stories/10-ways-reduce-plastic-pollution. Accessed 25 Apr. 2018. Irfan, Umair, and Eliza Barclay. “7 things we’ve learned about Earth since the last Earth Day.” Vox, 23 Apr. 2018, www.vox.com/2018/4/21/17247994/earth-day-2018-plastic-climate-change. Accessed 25 Apr. 2018. Winter, Stuart. “Beyond Blue Planet 2: Plastic ocean horror claiming hundreds of turtles a year.” Express, 12 Dec. 2017, www.express.co.uk/news/nature/891433/plastic-ocean-pollution-killing-turtles. Accessed 25 Apr. 2018. Wearden, Graeme. “More plastic than fish in the sea by 2050, says Ellen MacArthur.” The Guardian, 19 Jan. 2016, www.theguardian.com/business/2016/jan/19/more-plastic-than-fish-in-the-sea-by-2050-warns-ellen-macarthur. Accessed 25 Apr. 2018. Nice Job Ethan- I’m convinced this is the right thing to do! I like that you choose to raise awareness so that people know WHY we should recycle plastic!